Way back (early 90's) when I first started programming, I used QBasic (and later QuickBasic) a lot (if you're bored, see programming.html for a brief history of me and programming). Anyway, here are some of my old programs. DISCLAIMER: I am not responsible for any problems that may result from you using these programs - download at your own risk. If you don't agree with that, don't download them. LICENSE: These programs are distributed under a pretty open license. Basically, I retain copyright on the original code, but you can do whatever you want with the programs (including sell them if you think you can find a market). You can make any modifications you like. I would, however, like to be credited (although it isn't necessary) in anything you create from my programs, preferably with a link to http://www.scorpioncity.com/basic.html. This calls interrupts for the mouse handling, so it requires at least QuickBasic 4.5, which must be started with the "/L" option. There is a version for both QuickBasic 4.5 and 7.1. I wrote this a few years ago in a few hours, just for fun. 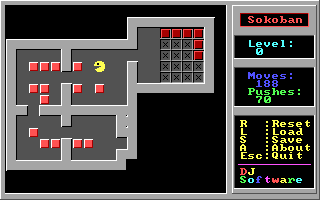 I first wrote a text mode version, then I revamped it to use graphics mode; here's the VGA/EGA version. doiley2.zip 5 KB (Source code only). 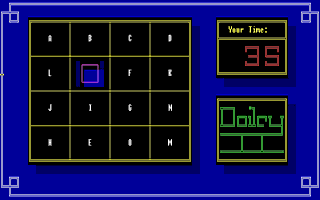 Version 2 of Doiley, a 15-piece slider puzzle. I did a C++ version of this for Windows too. 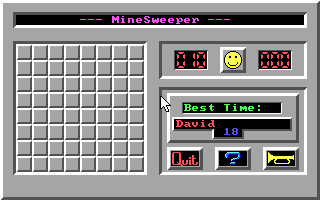 This should run on QBasic, I think. specfont.zip 1 KB. This uses interrupt 10h calls to set the text mode font to look like the old ZX Spectrum font. Written for QB 7.1, but should be easily modifiable to work with version 4.5.
tog.zip 12 KB. You are adventurer Flodd (sic). Monsters run (?) about trying to kill you. You may want to change the start-up level to check out the levels; change line 125 to change the start level. car.bas Silly little program. I had just learned about equations of motion at school - Wheeee!!! tictacto.bas A really early program of mine. Don't expect it to be very useful, but it might be worth a laugh or two. The keys are w,a,x,d and space to place a piece; I did not know how to read the arrow keys back then. Meaningful identifier names were a concept I initially rebelled against .. so don't be surprised if you see labels like "itchyleg" and "hotsoup". All downloads on this page in one zip file: allbasic.zip (157 KB).